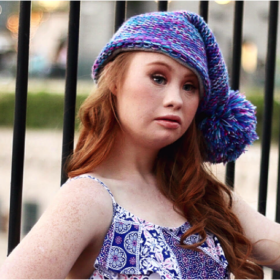 Madeline Stuart is the first adult professional model with Down syndrome. Maddy is breaking boundaries and inspiring others to chase their dreams. Maddy is wearing a personal custom color selection in the “lollipop” silhouette that using a circular knit and features an oversized pom-pom. This hat has a fleece liner and is oversized in height to create the specific look Maddy wanted. Icebox MFG enjoys working together with Twill on the Maddy by Twill beanie collection. And supports the ideology for each purchase, a portion of the proceeds will benefit children and adults with special needs. My Twill of Albany New York is a buy-one give-one company based in helping children in need. Icebox MFG partnered with Twill a few years back building beanies to help fulfill their goal as a for purpose company with a mission of giving back. “Every purchase has a purpose of helping our local friends in need.” Zac Hollard, Founder and CEO of My Twill. Icebox MFG latest endeavor was to build 2,700 fleece blankets for My Twill’s Giving Buddies program which has helped 10,000 children and families around the world!We ordered 2,800 meters of fabric for this build; each blanket was cut, folded, trimmed with an Acrylic yarn via our serger sewing machines, folded again, labeled, final fold, bagged and boxed!